“Nearly live” LP from Medway's leading garage-psych outfit led by former Prisoners bassist Allan Crockford. We've had the pleasure of featuring releases from The Galileo 7 in the past on Harmonic Distortion - Their FalseMemory Lane LP from 2014 and last year's 7” on State records 'One Lie At ATime'. Good to know then that the band are as busy as ever. To coincide with their recent French tour the band have released a blistering “nearly live” LP entitled The Live-O-Graphic Sessions. The 10 tracks give you an alternative “best of” and offer a taste of what the band sound like live. And that's pretty darn tasty! Spontaneously recorded in the space of an hour with the help of Jon Barker (The Senior Service) at his ad-hoc studio set up amidst his lithographic printing press premises, the album is less soft-psych than their previous studio outings and back in touch with their garage band roots. Power-pop melodies and harmonies backed up with drumming set to the rarely heard Keith Moon energy level. The VU meters must have been working overtime, with the songs gaining extra brio and brashness as a result. Recommended. 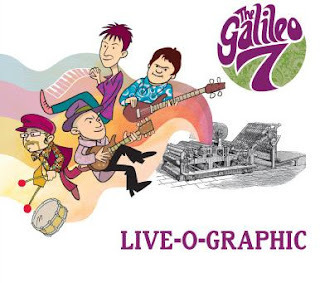 Look out for The Galileo 7 at the Medway Legends Weekender in San Sebastian, Spain on June 3rd. Clickhere for the The Galileo 7's website. Smashing Time - Satire on swinging '60s London. HYPNOS - Cold Winds - New album out this month!